What relevance does seasonal eating have for parents and children? How can you make the most of the seasons? And when you can pick up strawberries in November, why should you be constrained by seasonal availability? This Cookery Group Topic is an opportunity for your group to explore the benefits of seasonal eating – and discover new ways to make the most of each season’s ingredients. Why Eat With the Seasons? It saves you money: it stands to reason that British produce, grown nearby and readily available, is cheaper than air-freighted produce from overseas. It supports your local economy: buy buying British-grown food you are directly supporting local farmers and distributors, and keeping the money in our country boosts our economy and buying power. It’s how our ancestors did it: naturally, our bodies demand different foods for different seasons. In winter humans have traditionally built up energy and fat reserves for the colder weather; nature provides root vegetables for nutritional, substantial meals. In summer we need cool food, fast energy and less of the slow-release stuff. It’s a good way to vary your diet: in the UK, our climate enables us to grow different things at different times of the year. That’s a good thing – it means you will be getting different vitamins every month of the year. It’s better for the environment: because your food has not travelled a long way, and because it’s grown using natural resources, rather than heated glass-houses and artificial conditions. It means you’re eating a wide range of foods: which makes a balanced diet easier to achieve. What Should You Eat By Season? Here’s what you have to work with – and some child-friendly ideas for using new vegetables each season. Spring: Broad beans, radishes, lettuces, asparagus, wet garlic, celery, artichokes, beetroot, purple sprouting broccoli. TRY: stir-frying PSB and spring onions, adding cooked noodles and dressing with fresh ginger, coconut milk and soy sauce. TRY: foraging for wild garlic in a local woodland: at home, turn it into a spring risotto using vegetable stock, Arborio rice and lots of parmesan. Autumn: Tomatoes, courgettes, peppers, pumpkins, squashes, fennel, then leeks, greens, and carrots. TRY: roasting discarded chunks of your Halloween pumpkin, and tossing them with double cream and parmesan, before serving over tagliatelle. 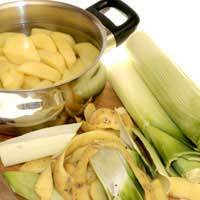 TRY: using leeks instead of onions to make a tomato pasta sauce, or whizzing up a creamy leek and potato soup. Winter: Swede, parsnips, celeriac, leeks, cabbage, chestnuts, stored apples and pears. TRY: mashing swede or celeriac with your potatoes (use a 50:50 mix), adding butter and milk to appeal to fussy eaters. TRY: making a wicked toffee apple crumble: soften chunks of apple in brown sugar and butter, then top with oats and nuts and bake in small portions. Summer: Runner beans, courgettes, shallots, sweetcorn, spinach, tomatoes, peppers, herbs, aubergine and chard. TRY: dicing courgettes, peppers and tomatoes very small, and stewing to make a thick tomato sauce – then mixing with cooked pasta, topping with cheese and grilling for a nice, melty topping. TRY: getting the children to help you make ‘kebabs’ – alternate marinated chicken chunks with halloumi cheese, cherry tomatoes and pieces of coloured pepper, before brushing with flavoured oil and barbecuing.